This is so long overdue, as I have been meaning to share and encourage you to pick up a copy of Meg Kearney’s Home By Now (Four Way Books, 2009) for a long, long time. Belated or not, this is still a book I highly recommend for its cleverness, insightfulness, and pure joy of language. I don’t want to ruin it for those who haven’t yet read the full poem, but you must believe the metaphor plays out so magically, so cleverly, that it’s probably the most known and loved piece from this collection. 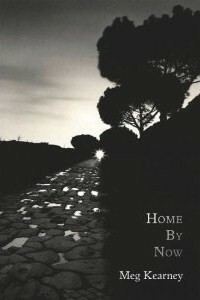 Long lines that linger, short lines with emotional punch, persona and voice that capture your breath and make you crave more… Home By Now is a fascinating collection that gives so much in 60+ pages, in such an accessible style that’s zeroed in on language and emotion, it’s impossible not to recommend. Trust me, you’ll fall in love. Actually, don’t just take my word for it. Home By Now was the Winner of the 2009 LL Winship/PEN New England Award for Poetry, a finalist for the Paterson Poetry Prize, and a finalist for Foreword Magazine's Book of the Year. Not bad. Now go check it out. Opportunity: want an author signing at AWP?